Natural catastrophes, including a devastating series of hurricanes and an intense wildfire season in the Western United States, have stressed many regions of the country during the third quarter of 2017. 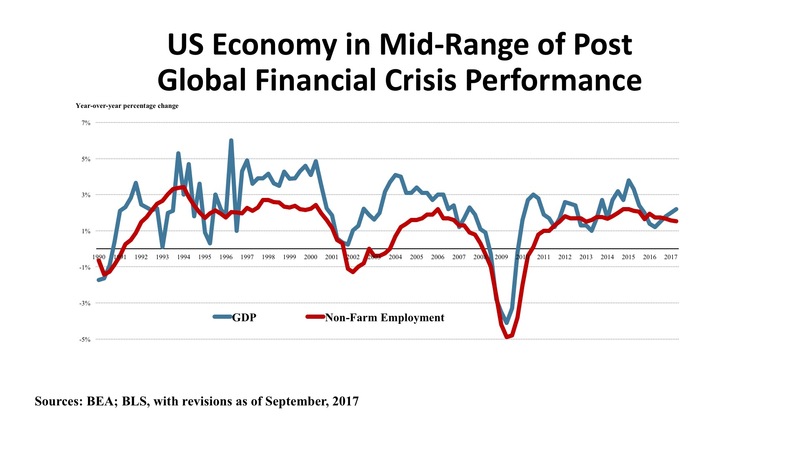 Nevertheless, the economy has thus far held steady within the moderate bounds of growth that have typified the recovery from the Global Financial Crisis of a decade ago. Although short-term impacts of the storms and fires will make headlines, the economy is large and resilient. It should sustain momentum with year-over-year GDP growth of 2.0% - 2.5% for both the remainder of 2017 and through 2018. Mixed signals typify the reports from key economic sectors. Consumption, which represents about 70 percent of the U.S. economy, had a second quarter uptick as it did a year ago. In 2016, second quarter personal consumption grew at an annualized rate of 3.8 percent (up from 1.8 percent in the first quarter). This year, second quarter spending hit 3.3 percent (up from first quarter’s 1.9 percent). This pattern of a weak first quarter has frequently been seen since 2010. Existing home sales are running at 5.35 million, up just 0.2% year over year, the median home price is up 5.6 percent from a year ago. An increasing trade deficit acts as a depressant on GDP growth, and while real exports have been up 1.9% (as of August), real imports expanded more quickly at 2.8 percent. The “signal”, however, should give us deeper concern. That is the true trend, and it is measured by the now two-year-old slowdown in job growth – even before the storm impacts. Employment growth from mid-2014 until October 2015 posted year-over-year gains of two to 2.3 percent. We have not seen two percent growth since then, and average 1.5 percent for the first half of 2017. So the trend is a slow but persistent attenuation of job gains. As we have indicated before, this is a story of increasing labor shortage caused by age demography, technological change, and a slowdown of new immigrant workers. The BLS “JOLTS” report (Job Openings and Labor Turnover Survey) showed healthcare and social services openings up 71,000, but declines in manufacturing (17,000), education (51,000), and other services (95,000). Overall, through August, the annual new hires tallied 63.8 million workers, versus 61.7 job separations, for a net gain of 2.1 million. This has been enough to drop the official unemployment rate to 4.2 percent, as of September. Policy. Thus far, deregulation by executive order and by agency implementation has been the principal policy tool put to effective use in the first year of the Trump administration. In this, Federal policy has aligned with Wall Street hopes and expectations, extending the post-election bump well into 2017 and driving the DJIA up to 22,871 as of October 13, 2017 – or 26.4 percent higher than a year prior. As has been the case for a decade now, it is at the Federal Reserve where policy has been most effective and most transparent. Looking at the “signal” rather than the “noise,” the Fed is on a slow but steady course of tightening monetary policy, by moving interest rates gradually upward (despite still languid inflation) and reducing the huge balance sheet of assets acquired during the Quantitative Easing programs. Feeling that the markets are well-served by predictability, the Fed has been clear that its intent is to maintain a path of incremental adjustment rather than drastic policy shifts. Outlook. There has been little change in outlook since the last edition of the TCN newsletter was prepared in July. GDP growth will fluctuate from quarter to quarter but stay in the 2.0 to 2.5 percent range on a year-over-year basis. Some upward drift in interest rates can be expected, but many are tiring of the wait for higher rates and believe it will be more than a year before the ten-year Treasury yields three percent. For the first time in decades, we may see a “soft landing” to an economic cycle rather than a hard recession. Right now, it looks like geo-political risk rather than economic dislocation is the main threat on the horizon. One variable to watch, though, is the continued widening of the incomes gap, likely to be the factor with the greatest potential to destabilize the trend of moderate upward expansion we have recently enjoyed. The good news is that 2017 brought sufficient rainfall to the Western states that the severe drought that afflicted the area over the past 20 years eased enough that (with the exception of a small portion of Montana), the most severe rank (D4 – exceptional drought) disappeared from the region. However, the lingering effects of the drought (which NOAA, the National Oceanic and Atmospheric Administration thinks likely to return) set the stage for an epic fire season in the summer and early fall. Thus far this year, the direct cost of fighting wildfires has exceeded $2 billion, but this is dwarfed by the overall economic impacts now estimated to exceed $85 billion so far, with weeks of fire threat still ahead. More than two million acres have burned, and with the Northern California fires invading dense residential neighborhood and the state’s vaunted wine country, thousands of homes and businesses have been destroyed. California has more than $2.8 trillion in Gross State Product ($58,619 per capita). 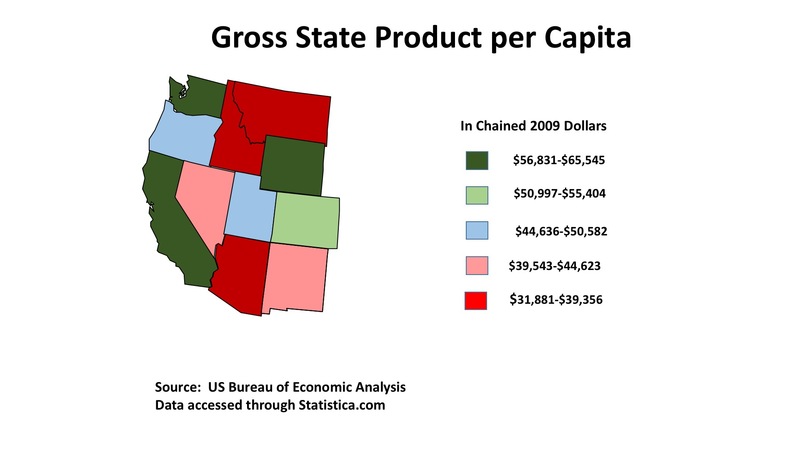 While the State of Washington’s GSP is just $578 billion (only economists can say “just” $578 billion), its per capita output is $56,831 – one of the top ten in the nation. Wyoming’s energy industry combined with its sparse population also lifts that state into the top ten. Why is this important for real estate? Productivity (measured by per capita output) is a vital measure of residential and commercial income potential since it is production that pays the rent, after all. The economic base of the West is very much a study in contrasts, from some of the most populated and technologically sophisticated markets in the country to some of the most rural and remote. Software, cloud computing, and on-line retailing are producing a surge in high-paying jobs, and skilled workers in these sectors are in short supply. But so too are agricultural workers and construction workers, pushing these industries to employ more advanced technology to bolster output per worker. Wages are facing upward pressure, especially in the tech-based metro economies. Of course, this is creating intense housing pressures and a huge contrast in the affordability profiles of the denser coastal areas and areas further inland – including cities like Phoenix, Las Vegas, and Salt Lake City. Home construction in the high-priced areas has accelerated but faces a real limitation on developable land – a factor contributing to exceptionally long commute times for many. This may augur well for population and employment growth in the West’s secondary markets. The sprawling region of the West, with its great physical contrasts, vast tracts of land, and diversity of population and economic activity has long been a focus of the American imagination. Given the region’s vitality and its position in technological innovation, and the aggregate wealth concentrated on the Pacific Coast from Seattle to San Diego, it is stunning to see the West ranking third out of the three broad regions in total First Half 2017 real estate investment volume. And it particularly puzzling to see that it ranks lowest in three specific property types: retail, industrial, and multifamily. Overall, the West tallied investment volume in the First Half of $62.3 billion (fully $30 billion less than the East), with the Pacific and Mountain states capturing just a 28.3 percent share of the nation’s $219.9 billion in total investment. Office. Office captured the greatest share of investment activity in the Western states, $19.9 billion, or 29.1 percent of US office acquisition volume. 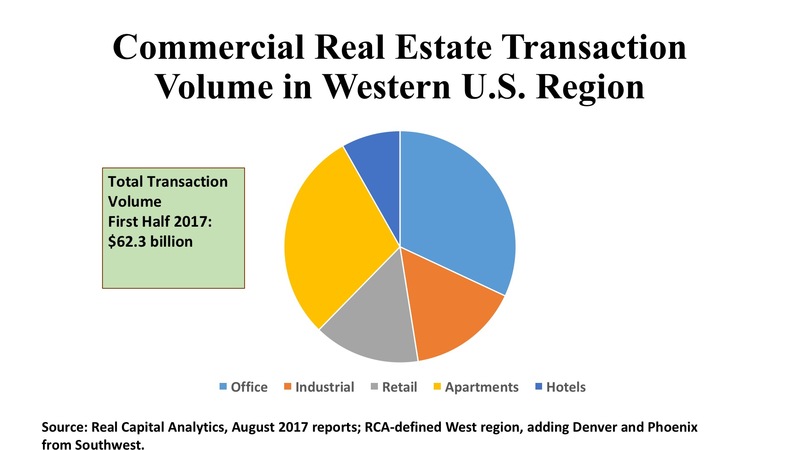 (As can be seen in the accompanying pie chart, multifamily ran a close second to office in the West, with $18.4 billion in transactions.) Investor interest in offices was well distributed on the Pacific Coast. Los Angeles led with $4.7 billion generated by 161 deals. San Francisco ranked second with just 46 sales producing $3.2 billion in total price. But Orange County, San Jose, and Seattle also surpassed the billion-dollar mark, signal evidence that the kind of per capita output illustrated on the this quarter’s regional map does make a difference for real estate markets. Metros dominated by strong CBDs – such as San Francisco, Seattle, and Portland – are averaging cap rates below six percent. Other metros, where a greater proportion of office transactions are suburban, have cap rates above six percent and, in the cases of Salt Lake City and Las Vegas, above seven percent. Industrial. Real Capital Analytics tallied 988 industrial transactions in the Western states in the first six months of 2017, summing to $9.7 billion in total price, or 31.3 percent of the national total for this property type. This is obviously healthy volume, but not extraordinary given the size of the industrial markets at ports such as Los Angeles/Long Beach, the Inland Empire, the San Francisco Bay area, and Seattle/Tacoma. Industrial assets in these markets are very much in demand, as indicated by L.A.’s average cap rate of 4.9 percent (a figure matched by the tech-dominated San Jose market). Los Angeles surpassed $2.2 billion in industrial property sales, with San Jose ranking second in the region with $1.2 billion. The Inland Empire also stepped over the billion-dollar threshold, with 99 deals priced at an average 5.6 percent cap rate. The remaining five billion dollars – beyond these three markets – was distributed liberally in the region, and typically priced at an initial yield higher than six percent. Retail. Shopping properties traded slightly less actively in the region than did industrials, with the retail sector marking 836 transactions and total investment of $9.2 billion. This represented 26.7 percent of US retail investment for the First Half 2017. By contrast, the East registered $15.8 billion (45.8%) of shopping property investment over the period. Private investors were the predominant buyers in most markets. The exceptions were Portland and the Inland Empire where institutional investors were active, and the Bay Area as well as Los Angeles where REITs were significant acquirers. International investors in Western retail properties were sparse. A few market witnessed average cap rates below five percent: Orange County, San Francisco, and San Jose. 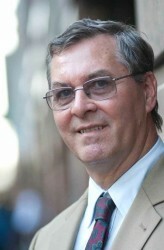 Otherwise, initial yields typically fell between six and seven percent.